How’s that for a title? Sometimes I find it so hard to create recipe title that effectively communicates all of the great elements in a dish but isn’t a paragraph long. So sometimes they are a paragraph long. And it made me really happy to see that Martha does it too 🙂 This recipe was in this month’s Martha Stewart Living Magazine. It caught my eye because I’m always looking for ways to be sneaky and slip extra veggies into family meals. 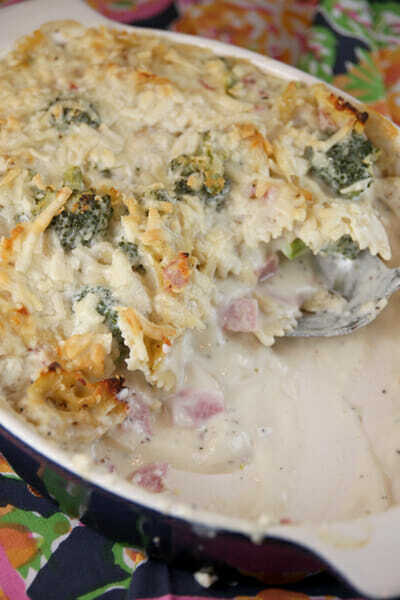 This one has cauliflower pureed right into the creamy cheesy sauce and you will have absolutely no idea it’s in there. It’s also made with nonfat milk and packed with a whole head of not only cauliflower but broccoli too. Use a multigrain pasta and you’ve got a healthy, hearty, comforting meal in no time. First saute some cauliflower, shallots (I used onions instead), and garlic. Cauliflower isn’t my favorite vegetable; I couldn’t eat it raw to save my life, but I’ve found several ways to cook it that I really love (I’m going to share one next week) and one of them is like this, pureed into a sauce. 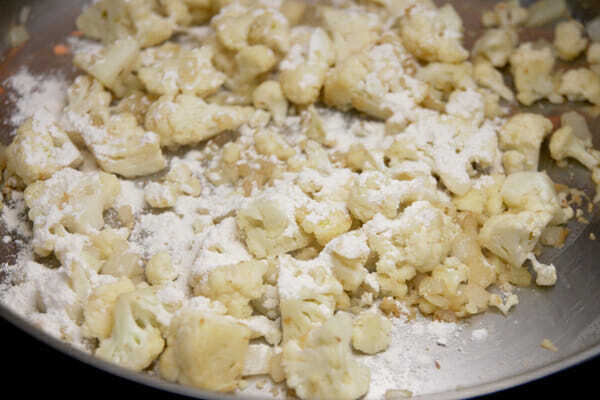 Since cauliflower doesn’t have very much moisture at all, your pan might get a little dry. You can add a little more oil, or I added a little water several times to make sure it wasn’t sticking to the pan. and dice up some sliced ham. I just grabbed some sliced smoked ham from the deli department and asked him to slice it a little thicker than a normal sandwich slice. 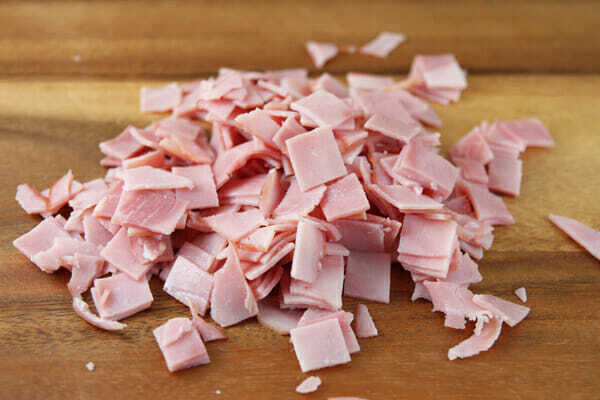 You could also use a diced/cubed ham, but cutting up sliced lets you use less and have it go further. When your cauliflower is nice and tender (we’re talking super soft- you want it to puree) remove it from the heat to let it cool off just a bit, and grate some Pecorino cheese. If you’ve never used Pecorino before, it’s really yummy. 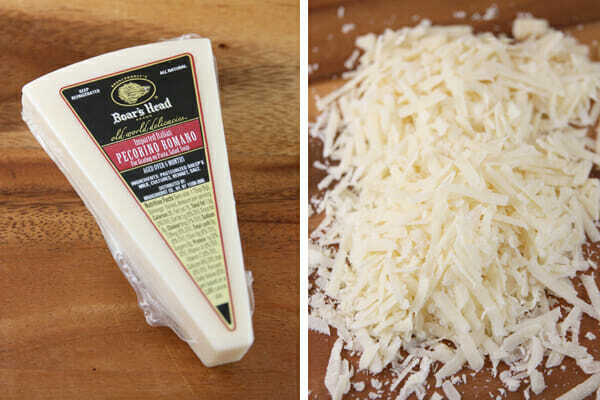 It’s similar to Parmesan, but with a slightly stronger flavor. The benefit of using a strong flavored cheese is that it allows you to use a little less and still have the flavor come through in the dish. We’re using the whole wedge here though, so it’s not like we’re hurtin’ for cheese! If you can’t find Pecorino, or it’s too expensive, you could sub parm and this would still be good. I’d recommend using a a fresh Parmesan that you grate yourself for best results. 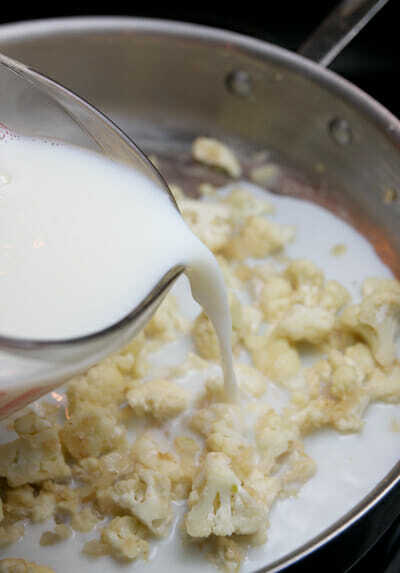 Pour your milk and cauliflower into a blender and add half the cheese. Puree it until it’s really smooth and then pour the sauce onto your pasta. 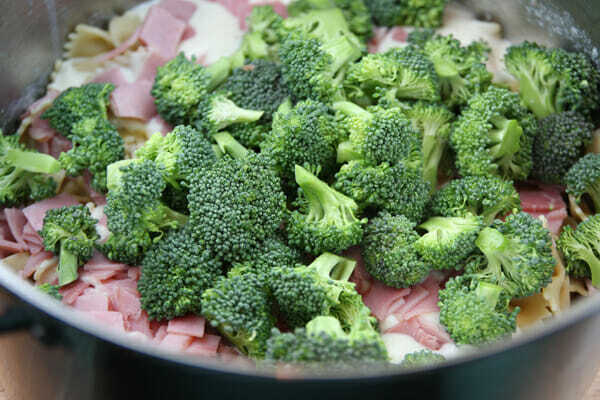 Then add the ham and broccoli. And here’s a little tip. Even after cooking in the oven for 30 minutes, my broccoli was crisp-tender. If you (or your kiddos) like it softer, you could toss it into the hot pasta water for the last minute or so of cooking; just to give it a head start. 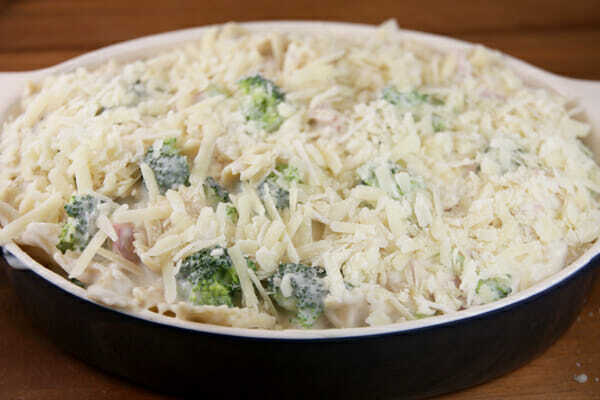 Place the mixture in a casserole dish and top with the rest of the cheese. and bake it until it’s bubbly and golden brown on top. See that rich creamy sauce? Who would have guessed the base was non-fat milk and cauliflower? Not my 3 little kids, that’s for sure. 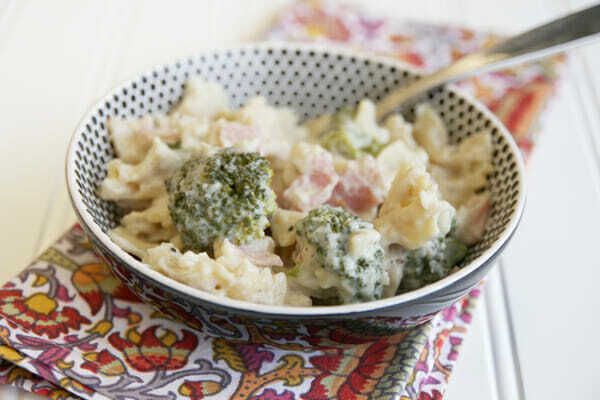 When I was eating this I realized you could easily get similar results by blending cooked cauliflower into our Guiltless Alfredo Sauce (that goes in the blender anyway) and stirring it up with steamed broccoli and ham. So that’s another option! optional: 1/2 cup toasted whole-wheat panko (Japanese bread crumbs) for serving. Heat oil in a medium saucepan over medium heat. Add cauliflower, garlic, shallots, and 1/2 teaspoon salt; cook until softened but not brown, about 10 minutes, stirring occasionally. Sprinkle with flour; stir to coat well. Gradually stir in milk; bring to a boil. 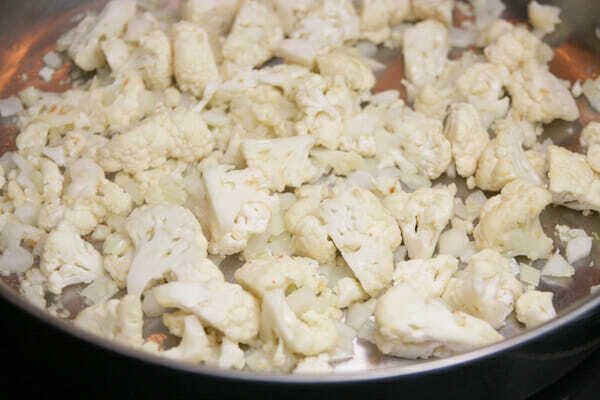 Reduce heat; gently simmer until cauliflower is very soft, about 15 minutes. Let cool for 5 minutes. 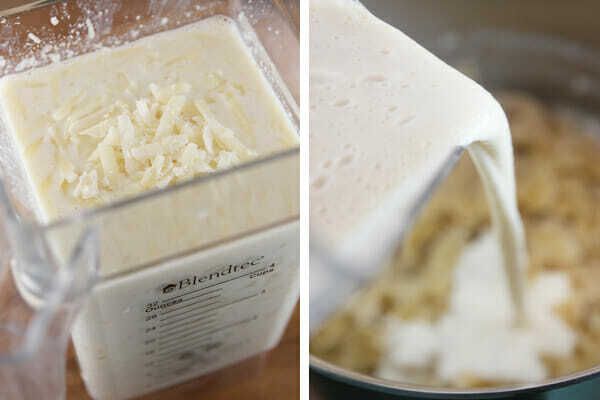 Transfer all to a blender, and puree with nutmeg and half the pecorino until smooth, about 2 minutes. Preheat oven to 400 degrees. Meanwhile, bring a large pot of water to a boil. Cook pasta until slightly tender but not fully cooked, about 5 minutes. 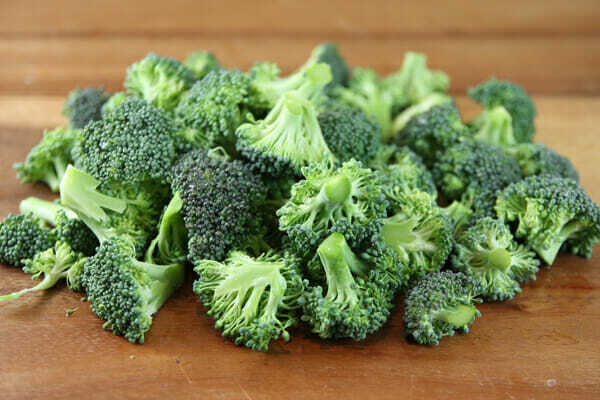 (Note: If you like your broccoli pretty tender, add it to boiling pasta water for a couple of minutes before draining) Drain well; return to pot. 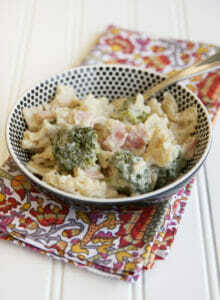 Add ham, broccoli, and cauliflower sauce; toss to combine. Transfer to an ovenproof 3 1/2 quart baking dish. Sprinkle with remaining pecorino, and bake until bubbling in center, about 30 minutes. Heat broiler, and broil until golden brown on top, 1-2 minutes. Divide among dishes, top with breadcrumbs (if using), and serve immediately. Yum! I am going to make this very soon!! I’ve been staying up way too late and dinner was hours ago, and this looks really delish- plus, you make it look so cute when you dish it up. Was Martha’s title a paragraph long as well? This sounds REALLY good. We do Bountiful Baskets and I’m often stumped what to do with cauliflower when we get it so it’s not always the same old, same old. This I will definitely have to try. Yum!! I’m making this for dinner tonight! We aren’t big fans of cauliflower, but we ended up with a huge veggie tray, and I need to use it up. Thank you! Looks yummy. I am not a fan of cauliflower but it’s mostly a texture thing (although I love broccoli so that must not be the only reason), but I think I could try it in something like this. This looks fantastic. My 4-year old, who used to eat veggies like chocolate, is now in the “veggies are yucky” stage–so I’m loving the idea that there is cauliflower in this sauce. I’ll be trying this soon, for sure. Thanks for sharing! I tore this one out too—it looks so great, glad to hear it was a success! 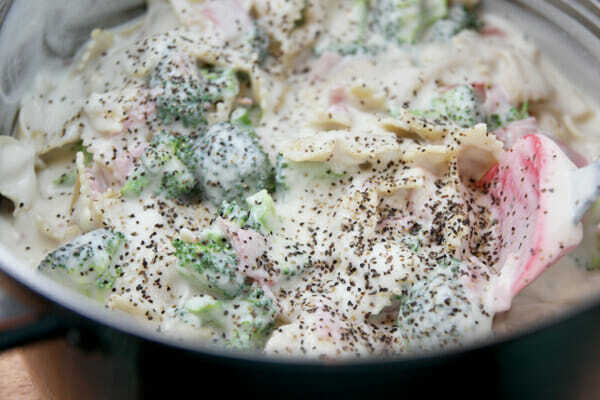 My mom used to make a cheese sauce for the cauliflower and the broccoli both when we were younger just so that we would eat our veggies – this looks fabulous with the ham and the cheese baked on top! I need to add this to my list of must try recipes as I suspect it’s pretty close to my Mom’s. Yay for a recipe with sneaky vegetable additions! It’s helpful for my toddler who prety much won’t eat any veggies at all. I’ve really wanted to try a cauliflower puree in a cheesy pasta like this. Can’t wait to give it a whirl. It looks so so good! Sheri, just visit our recipe index and you should spot what you’re looking for. I’d check pastas or the Asian section! This looks amazing! I love cauliflower anyway but won’t object to it being in a sauce. Usually I have a list a mile long of recipes I want to make soon, but this one may be bumped up to the top. Yum. Great trick to sneak more veg into my hubby’s tummy. He LOVES alfredo…hee hee hee…makes me feel so sneaky! I can not eat broccoli because I am on coumdin … But I am totally making this for the kids!! Is there something I could sub for the broccoli? Not a leafy green veggie! Please? I am going to make this right now ( sounds much better than the tacos I was planning on making). I have been sneaking cauliflower in my mashed potatoes for years, my kids still have no idea that their FAVORITE food is fifty percent cauliflower. Muah ha ha ha! Ohhh can I pick off each and every one of those crusty pieces of cheese and hoard them for myself please????? I saw this in MS’s magazine and made this tonight. My 5-y-o son had seconds… that’s saying something. It was delicious! Ok, this looks so yummy! I will definitely make it. But it would be even more fun with those adorable bowls. I cannot resist adorable bowls. Where did you find such cute ones? 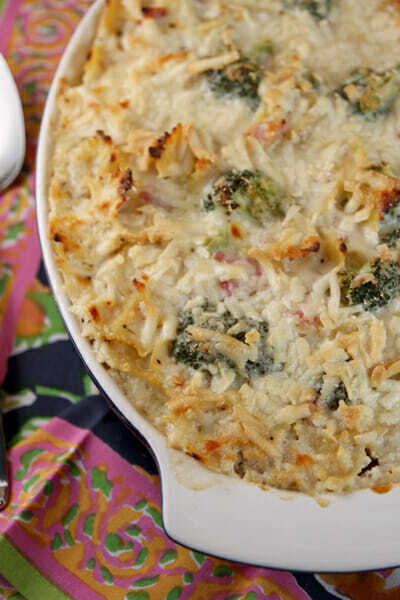 Could you freeze this before you add the cheese on top and then bake later? Probably. I’ve never tried it so I can’t tell ya for sure, but I would think it would freeze just fine. Ideas on cheese I could sub? – maybe “italian” cheese? I made this recipe tonight and while the flavors were great, it was horribly soupy. So bad that I had to use a slotted spoon to serve it. I followed the recipe exactly, so I’m not sure what happened. Next time I will use about 2.5 cups of milk instead of 4. That’s strange Holly, maybe try cooking the mixture a little longer as well, or adding a touch more flour. This tasted kind of like quiche to me. We didn’t love it, but it was all right and a good way to use up a ton of broccoli and cauliflower that we had! And I think if I make it again, I’ll add corn, to make it even more like a quiche! hee hee! my 17 yr old is stoked to have pasta with cheese sauce tonight for dinner, and he has no idea that he’ll be getting veggies! thanks for the marvelous idea. I made this tonight, and we are NOT fans of this one, the texture was not palatable, this is the first recipe I have gotten from your site that I didn’t like. would this make a good freezer meal? if so, how would i go about freezing/baking it? I made this last night with chicken instead of ham and I put bread crumbs on top instead of more cheese. My husband and I thought it was fantastic but my kids all thought it was too cheesy. Go figure! I’m going to try it again with parmesan and see if that helps them. This turned out awesome. Since we are lovers of your alfredo sauce already, I took your suggestion and pureed the cauliflower into your alfredo recipe (which I doubled) with just minor alterations. It was awesome!!!!! The sauce was delicious and super creamy, and I kept sneaking pieces!! All of my children asked for 2nds and 3rds and they were ecstatic that we had it for leftovers the next day!! Thanks. Does the sauce need to be used immediately? No, you could refrigerate it Liz. It might thicken after being stored, but you could heat it up and just add a little milk to thin if it needs it. made this tonight! SO YUMMY!!!!!! I was a little nervous making this one. It seemed like it wasn’t going to turn out very good. I had to purée it in 2 different batches since all of the sauce wouldn’t fit in my blender at once. Then I simmered it a bit longer because it still looked like it would be quite runny. But after all was said and done, it turned out fabulous! And I didn’t need to broil it. The cheese got nice and crusty all on its own. I also used quinoa noodles which I had never used before. They were really good. My only complaint is that the recipe takes a while to make. Next time I’ll do more prep ahead. Made this tonight with fancy smoked chicken sausage instead of the Ham, turned out perfect! Thanks! Made your apple cinnamon cream cheese bites from the calendar today … DeLiSH!! Yes, it would probably taste great in that sauce! I’m trying this tomorrow! My kids are huge fans of Pasta Roni and I’m really wanting to get away from it, but finding saucy enough recipes without all the fat or cream is challenging. Yummy looking. Sadly, I also did not like this too much. The cheese was too bitter for my liking. I think if I do it again I will do parmesan and add a lot more ham than I did and probably more salt. Texture was creamy just weird flavor–maybe too much Romano. Just made this tonight, and I really liked it! My husband was suspicious when he saw me pureeing cauliflower (I’ve had a lot of kitchen fails lately; he has reason to be suspicious! ), but my kids asked for seconds, which means it’s a winner for me! I used parmesan, and put the breadcrumbs on right before broiling. Made this last night – so yummy and so easy. My husband, who would put ketchup on his ketchup if he could, said “no thanks, this is really good without it.” I was blown away. As leftovers today for lunch, I added some fresh dived tomatoes – still super yummy. This is a keeper for me. Thanks for the recipe! I think it would taste better with a 2% milk with some heavy cream sneaked in. Yeah…tried this and my family saw right through the sauce..only my husband would eat it! Oh well..it was worth a try! Is it possible to just make the cauliflower sauce and stop after pouring over the pasta and mixing it in? Or is it necessary to bake it after?